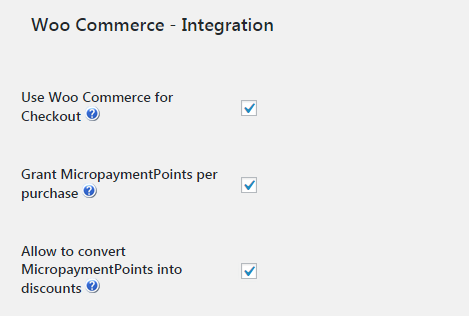 If you choose to use the WooCommerce integration option, the only payment related setting within the CM MicroPayment Platform you have to select is the Use WooCommerce for Checkout. After saving the changes you’ll be notified about the fact that all of the CM Micro Payment Payments Settings have been disabled. For the setup of payments and payment gateways in WooCommerce please refer to the WooCommerce plugin’s help. 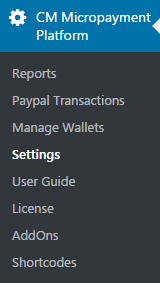 Navigate to the Admin Dashboard -> CM Micropayment Platform -> Settings. Use WooCommerce for Checkout – all of the Payments will be forwarded to the WooCommerce checkout. The integration is transparent. You don’t have to manually add the products to the WooCommerce product catalog. It will be done automatically for each entry from the Point Price table. The changes will be replicated as well. The products will have the category assigned so they stand out. Grant Micropayment Points per purchase - This option allows you to grant virtual currency points for purchases users make in your WooCommerce shop. This can reward users for purchases they are making in your store which they can also convert later to coupon codes or purchasing directly with the virtual currency in your store (the last two options needs to be enabled to support this). Allow to convert Micropayment Points into discounts - This setting option allows users to use the shortcode to use the accumulated points to buy the discounts for WooCommerce products. The conversion ratio between points to real money value is based on the MicroPayments setting. Discount codes can be used in the checkout before making the payment. Allow only to buy products with Micropayment Points - You can add the MicroPayment also as a payment gateway in your WooCommerce checkout page. This means that once paying for products user can choose to pay with thier virtual currency. The conversion between the real value of the product and the virtual currency will be calculated based on the MicroPayment setting for conversion rate. Of course it'll still be possible to buy packages of points with the real money using the other defined gateways. In the WooCommerce currency settings you can define the MicroPayment defined virtual currency as the default currency for your WooCommerce shop. This will display the price of each product as set in your product download page in MicroPayment currency value and will only allow you to pay with the MicroPayment payment gateway at checkout.